In 2003 the Norwegian Nobel Committee decided to award the Nobel Peace Prize to Shirin Ebadi for her efforts for democracy and human rights. Her focus has been especially on the struggle for the rights of women and children. 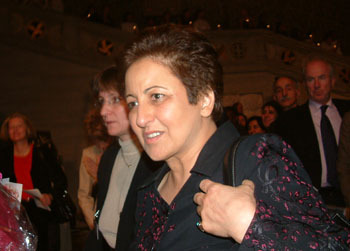 For 4 days in December 2003 pupils from Amot secondary school covered with text, pictures and streaming video events in connection with all the arrangements when Shirin Ebadi received the Nobel Peace Prize. Being so near the real life, also change the way pupils study and work. Shirin Ebadi - The Nobel Peace Prize Laureate. In this site we have 53 unique video clips and 208 pictures (in addition 146 thumbnails). Through text, pictures and video we have documented the events. As far as we know, no other web site in the world has documented the events so thoroughly with use of multimedia. This web site is dedicated to the work of Shirin Ebadi, and we hope this site can be a little contribution to her struggle from our students. Speech given by the Chairman of The Norwegian Nobel Committee, Ole Danbolt Mjøs. Because we have done it in this way, even people in Iran not speaking English can listen to Shirin Ebadis speeches, statements and interviews if they have an Internet connection. A young reporter from our school also had an interview with the Norwegian Prime Minister, Kjell Magne Bondevik and the artist Nina Persson from The Cardigans in Norwegian. 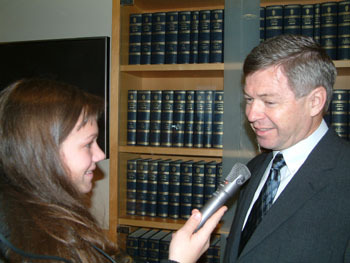 We also interviewed the Chairman of The Nobel Peace Prize Committee, Ole Danbolt Mjøs in our own language. Otherwise everything is in English. prime minister Kjell Magne Bondevik. For 6 year’s pupils from Amot secondary schools have had the editorial responsibility for the nationally based Internet paper called The Youth Paper (Ungdomsavisa) in December. Each month a new school takes over the editorial responsibility for the paper. December month is in Europe connected with Christmas, but in Norway the month is also in Norwegian mass media, connected with the Nobel Prize Ceremony in Oslo. Off course, mass media reporters from other countries are also coming to Oslo in hundreds. In addition to the Ceremony, many important political meetings take place and world known artists are singing and playing at the Noble concert broadcasted over television to countries all over the world. For weeks before the departure from our small society Rena, 180 km north of Oslo, the pupils had to study Shirin Ebadis career and her struggle for the rights of women and children. Like real journalists the students have been accredited by the Norwegian Ministry of Foreign Affairs. The students take part at the press conference with the winner of the prize, the Noble prize ceremony, press conference with world known artists and political meetings. 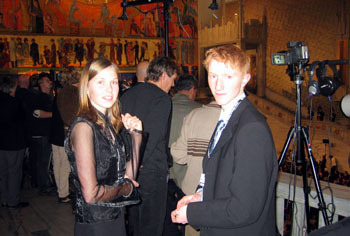 Two of our students at the Nobel Peace Prize Ceremony. Shortly one may say that the students come close to leading politicians and world known artists. And as the pictures and video show – these politicians and artists take the students serious. They answer questions and are willing to be exclusively photographed. In the colomn on the top right side, we have translated three of the articles into english. You can also see all articles made on our trip to Oslo as they were displayed in The Youth Paper. The pupils take the bus to Oslo and are living at a hotel. They begin immediately to work when they come to the capital Oslo. This seems of course simple, but before the arrangements very much work has been done. On our way to Oslo..
Over years the school has established partnership and contacts with the press department of The Norwegian Ministry of Foreign Affairs, members of the Nobel committee, the Nobel Institute, well-known Norwegian politicians and others. We have got help from private persons, parents, public organizations and private firms. Establishing private/public partnership has been very important for the project. In the project the pupils work in a real world setting just like a modern net based paper. The articles must be delivered with strict consideration to dead line, photos must be made ready and video edited and saved in the right streaming format. Teachers must give feedback to students and action must be taken whenever new situations meet pupils. It’s our intention with this web site to empathise use of multimedia, pictures and streaming video. 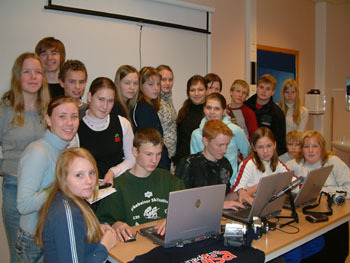 The school has high speed Internet access through the Norwegian University Net (Uninett) and fibre connection into the school. We have our own Internet web server and the streaming video is published from this server. We have chosen to publish video in Windows media format 9. The streaming videos are published in 3 qualities and the highest quality is 550 kbps. In the future when high speed Internet access is more common and speed higher, we want to publish streaming video with higher speed than 550 kbps. One day we hope we can have full screen video, even in high definition. In this site we have closely tried to follow to the standards issued by the W3C. Of course this is not the case with video. In video many formats are combating each other. There is no standard, but Windows Media is a market leader. With our server capacity we are not able to stream in other formats even if we wished.